Convenient accessibility to the massage oils and lotions you use in your practice. No more fumbling with loose bottles as you apply oils or lotions. 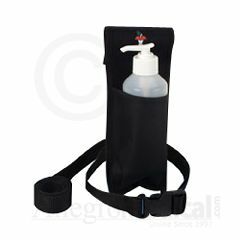 The holsters come with a strap or can easily be attached to your belt. Use on either hip. Constructed of durable canvas. Available with or without one eight-ounce bottle.